18 April 2016, at 6:00a.m. 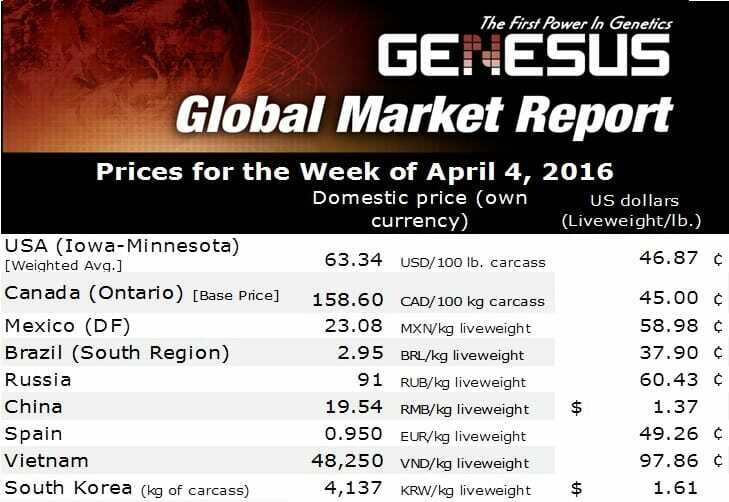 CANADA - Last commentary I showed the significant numbers of SEW/feeder pigs and market hogs making the trek to the US Midwest from Canada in the first six weeks of 2016, writes Bob Fraser, Sales & Service Genesus Ontario. The chart below updates that information now for the first twelve weeks of 2016 and also includes the movement of the Canadian dollar over the same period as compared to the previous year. SEW/feeder pigs are now up 12.04% year over year, with the west (primarily Manitoba) up 7.08% and the east (primarily Ontario) up a whopping 30.16%. Market hogs up 6.55% year over year, with the west (primarily Manitoba) flat at 0.18% and the east (primarily Ontario) up 13.02%. So Ontario’s solution to being short approximately 25,000 shackles of packing capacity with the closure of Quality Meat Packers coming on two years ago has been to send about 4500 more SEW/feeder pigs and about 4500 more market hogs than a year ago state side. This would seem to align with antidotal suggestions that Olymel (out of Quebec packer) who had been taking the bulk if not all the 25,000 market hog surplus was back on stream from their cooler issues of the 4th QTR. However the suggestion has been at a reduced amount and either has or is looking to not renew contracts with some of their Ontario suppliers. Would seem that the now approximately 16,000 per week surplus with what is going stateside maybe a better fit. At the Canadian dollar to the US dollar of $0.6883 that translates to $58.19 Cdn and $116.16 Cdn respectively. At the Canadian dollar to the US dollar of $0.7703 that translates to $51.99 Cdn and $103.79 Cdn respectively. A difference of $6.20 Cdn and $12.37 Cdn respectively on the same pig just due to exchange rate. Although it is difficult to turn your marketing options on a dime these are significant dollars! Now with the announcement of the Prestage Farms pork plant in Mason City IA Canadian producers and particularly Ontario producers are detecting better potential options to their lack of shackle space. Although the Triumph/Seaboard plant in Sioux City IA and the Prestage plant in Mason City IA don’t present viable options due to freight, their effects will eventually ripple out to Ontario’s shore. The coming additional shackles coming in the US will pull hogs out of the single Canada/US pot as packers jostle for hogs and market share. This hopefully opens up further marketing opportunities in the Eastern Corn Belt along with the Clemens Group new pork plant in Coldwater MI.